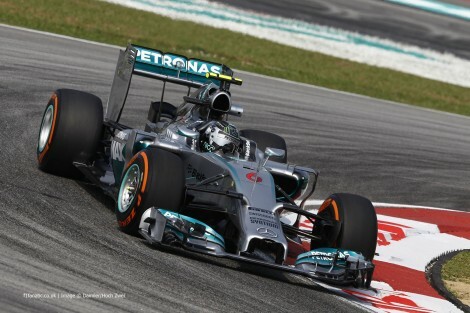 Home » Formula One: Mercedes duo top Friday practice in Malaysia! 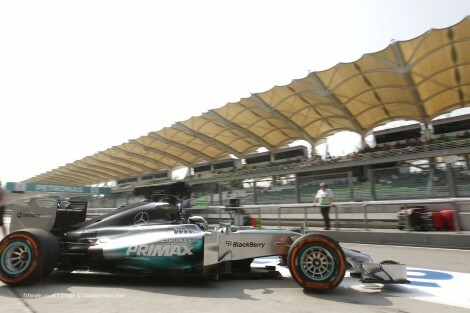 Almost two weeks after Nico Rosberg took the win in the opening Grand Prix of the season at the Australian Grand Prix, the teams regrouped again at the Sepang International Circuit for the start of the Malaysian Grand Prix weekend. Lewis Hamilton was the fastest man in the first 90 minute session with some time to spare in the middle sector of the lap. The gap between Hamilton and his next competitor wasn’t as large as the team had previously enjoyed in Melbourne. Lewis was only a tenth of a second quicker than Kimi Raikkonen, who showed a massive improvement in his Ferrari. Australian Grand Prix winner Nico Rosberg was third fastest ahead of the two men he shared the podium with in Albert Park; Jenson Button and Kevin Magnussen. Kevin had held the fastest time briefly, but his McLaren went into recovery mode and he had to crawl into the pits. Jean-Eric Vergne ended the first session in sixth ahead of Sebastian Vettel in the Red Bull and Nico Hulkenburg in the Force India. Former Ferrari team-mates Felipe Massa and Fernando Alonso were 9th and 11th, with the pair split by Massa’s new team mate Valterri Bottas. Felipe and Fernando both had similar spins at turn eight as some drivers initially struggled with handling. Daniel Ricciardo, who had finished on the podium at his home Grand Prix before being disqualified, was in 12th place and looked to have lost some of the pace he had in Melbourne. Three cars didn’t set lap times during the session, with both Lotus drivers still struggling after a dismal opening race. Sergio Perez joined them after suffering a fuel pressure problem. Mercedes continued to top the time-sheets in the second session, but now it was the turn of Nico Rosberg. Kimi Raikkonen remained in second place and was now a mere three hundredths of a second down on Rosberg. Sebastian Vettel was third fastest and appeared to show a massive improvement after an awful weekend in Australia. He was within a tenth of a second of pace-setter Rosberg. Vettel has been extremely vocal of his disappointment with the new Formula One engine sound. He has been quoted as saying that batteries should stay in phones. Fellow driver Jenson Button defended the sound by saying that if anybody didn’t like, then they should race in another series. Practice one leader Lewis Hamilton was fourth fastest, with both of the Mercedes cars seeming to wear out their tyres quicker than their rivals in the fifty degree heat of the session. Alonso in his Ferrari and Massa in his Williams were fifth and sixth fastest and were both within two tenths of the fastest time by Rosberg. Ricciardo was seventh fastest ahead of Button and Bottas, with Hulkenburg completing the top ten. Kevin Magnussen was down in 12th after seemingly losing pace after the first session. Two cars once again didn’t set times, with Pastor Maldonado struggling once again in his Lotus and Kamui Kobayashi in his Caterham. Maldonado’s team mate managed to set a time in this session, with Grosjean completing 14 laps before a gearbox problem.